December is often a month spent away from the garden, with the colder weather now with us, it can be very tempting to retreat indoors and not venture out into the garden at all. Most of the autumn colour has now gone from our gardens and the surrounding landscape and it can be a little bleak to say the least. Having said that, there are plenty of evergreen shrubs and plants with winter interest that can be introduced into our gardens to tempt us outside. Be brave, brace the cold and see what you can find at the nursery / garden centre to brighten up those dark, dreary December days. There are a few plants that help us through the winter gloom and Cornus is one of them. With their vibrantly coloured stems they provide fantastic structure in winter gardens and also contrast with early bulbs, especially the pure white of snowdrops. Later in the year, if left to flower, the large white bracts provide colour in the summer garden too. It is a large and varied genus, made up of 65 species of mainly deciduous shrubs and small trees. C. alba, C. sericea and C. sanguinea are the main producers of the coloured stemmed varieties. Cornus alba Elegantissima is probably my favourite and I use it a lot – its usefulness as a backdrop to summer flowering herbaceous planting with great winter structure, makes it a valuable part of any planting scheme. Cornus alba hails from Siberia, north China and Korea. Elegantissima is a cultivar of Cornus alba which has deep red stems, greyish green, white-margined leaves, small, creamy-white flowers and clusters of white berries. 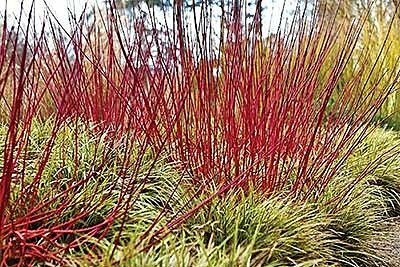 For the best show of red stems in autumn, cut them back hard each March. It’s tolerant of a wide range of soil types and produces the brightest winter bark when planted in full sun. Cornus alba Elegantissima looks fantastic when planted with evergreen shrubs and among spring flowers. However, I use it often as a specimen in a herbaceous scheme with a geranium, like Patricia, snaking its way through the summer foliage. It can be contained to a small space as long as its pruned yearly, making it suitable for smaller schemes too. Its a versatile shrub with so many attributes, however its best quality has to be the bright Red stems creating drama in the winter garden. • Give the borders one last tidy before Christmas by removing any debris, leaves etc. • Check newly planted shrubs for wind rock (loosened soil around base) after strong winds firming soil. • Avoid any pruning when frost or snow is forecast. • Replenish bird feeders as soon as they run out. • Plant winter flowering shrubs like daphne and sarcococca. • Prune acer, betula before mid December to avoid bleeding cuts. • Mulch if the weather is still mild. • Harvest winter vegetables like sprouts etc. • Clear any remaining plant debris and compost. • Prune free standing apples, pears, currants and gooseberries. • Do not prune stone fruit until spring to avoid silver leaf disease. • Prune grape vines by mid December. • Continue to plant fruit bushes etc. • Divide and re plant rhubarb. • Lag outdoor taps and pipes to avoid them freezing. • Ventilate greenhouse on mild days.